Black mold in homes is a serious problem for many home owners. Black mold in houses causes numerous health problems for those living in the houses and is often quite difficult to remove. Black mold in houses can lead to numerous health problems, though some people seem to experience more problems than others. 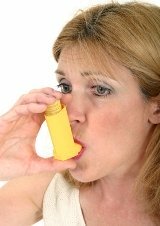 Infants and young children, elderly people, people with chronic respiratory problems like asthma and those with compromised immune systems such as people with HIV often experience more health problems as a result of black mold than others. However, many people that typically enjoy good health begin to suffer health problems after being exposed to black mold on a regular basis. Unfortunately, these symptoms do not usually respond well to medications as long as you continue to be exposed to black mold in your home. The black mold in homes must be removed in order for recovery to begin, and even then it can take some time to feel well again. This video explains how mold can affect your body. Keep the moisture level in your home between 40 and 60 percent. Make sure areas of the home that generate moisture, such as laundry rooms, bathrooms and cooking areas, have adequate ventilation. Repair any leaky windows, roofs or pipes as soon as possible. Those simple steps can go a long way toward preventing black mold in homes, but it’s no guarantee you won’t still develop a problem. Removing black mold is a difficult process. Some people prefer to tackle the job themselves while others prefer to call in a professional. Fix any leaks and increase ventilation in any high moisture areas as needed to prevent the development of more mold in the future. Carefully inspect the entire home for any signs of black mold so you can remove it all. If you leave even a little behind, it will just grow and you’ll be right back where you started. Seal off each room as you work to remove its mold so that mold spores cannot spread to other areas of the house. Cover doorways with large sheets of plastic and tape them in place. If you can, place a large fan near an open window so mold spores will be more likely to leave the house rather than cause further contamination. Fill a spray bottle with water and lightly mist all areas of mold. This softens and loosens the mold, making it easier to clean. Allow it to rest for several minutes. Next, wash the moldy areas well with hot soapy water. Then apply a disinfectant specifically designed to kill black mold to all areas affected by the mold. Follow the directions on the package. If you are not sure if a particular area is affected by the mold, disinfect it anyway just to be sure. Wood surfaces should be sprayed with a protective encapsulate to ensure that any mold that was missed doesn’t grow again or expand into the rest of the house. As you can see, removing black mold in homes is a time consuming, tedious process. However, it is imperative to remove black mold in houses if you and your family want to be healthy. Although many people try to remove mold themselves, we recommend you consult with a qualified professional. There is no cost for a professional evaluation and estimate, and they will give you valuable tips and advice while in your home. You can follow this link to get a list of local Mold Removal Specialists in your area. For additional black mold information on what is black mold and the dangers of black mold exposure, follow the links. If you suspect black mold in house, you need to do a thorough black mold inspection. Black mold can be toxic and cause many health issues, so be sure to take action right away. Although there are different types of black mold that may be found, they all need to be removed as soon as possible. 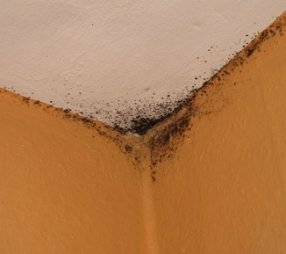 Follow this link to learn more about black mold clean up and for more facts about Stachybotrys chartarum and other molds. Black mold on ceiling and walls. Black mold can cause respiratory infections and asthma-like symptoms.